Explanation: Storms on the distant horizon and comet dust raining through the heavens above are combined in this alluring nightscape. The scene was recorded in the early hours of August 13 from the Keota Star Party site on the Pawnee National Grasslands of northeastern Colorado, USA. 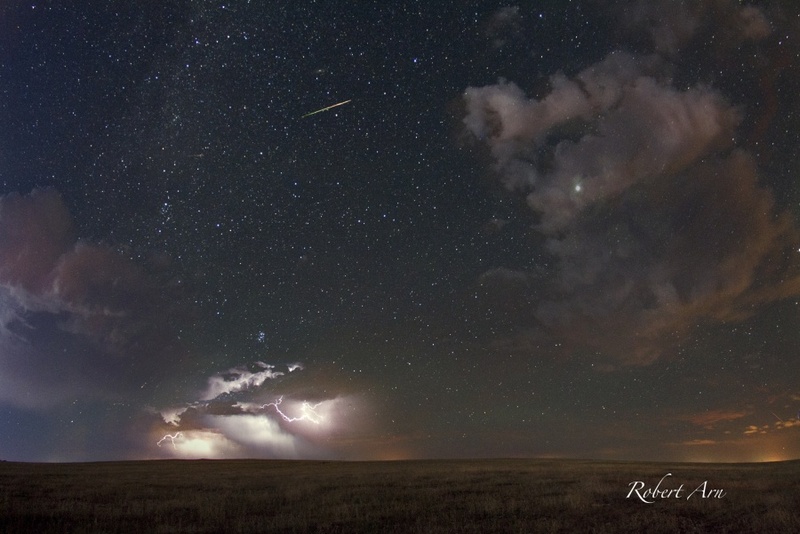 Looking east across the prairie, the composite of 8 consecutive exposures each 30 seconds long captures the flash of lightning and a bright Perseid meteor. On the right, even the clouds can't block the light from brilliant planet Jupiter, whose mythological namesake knew how to handle both lightning bolts and meteors. Of course, this meteor's streak points back toward the shower's radiant in the heroic constellation Perseus, sharing a starry background that includes the Pleiades star cluster poised above the storm clouds. Just above the bright meteor lies the faint Andromeda Galaxy. Tomorrow's picture: One galaxy or two?